I am not made of money. Greenbacks are not stuffed into my mattress. And the closest I’ve come to a Cartier watch is the advertisements I’ve gazed at in glossy magazines. Nevertheless, I cooked sea scallops. With porcinis. Lots of butter. And truffle oil. Yes, even in this economy. Before you think me crazy for making such a luxurious dish in a lean and mean time, I am here to say that is precisely why you should make such a recipe here and now. Because even when times are bad, we ought to spoil ourselves just the teeniest bit if we at all can. It’s what makes life worth living. And it’s what keeps us going. It’s a small treat to reassure ourselves that no matter what has befallen us, we’re still good people, and we still deserve good will, good tidings, and darn it all, good food to boot. To be sure, I had bought the truffle oil (even if most of the ones on the market are artificially flavored) and the dried porcinis in flusher times. But the great thing about these ingredients is that a little goes a long way. A dab of truffle oil, a few ounces of dried mushrooms — each adds so much more depth and complexity greater than their minuscule amounts used. This simple recipe for “Baked Scallops with Porcini Butter” comes from one of my favorite cookbooks of last year, “Fish Without A Doubt” (Houghton Mifflin) by Chef Rick Moonen of RM Seafood in Las Vegas, and writer/editor Roy Finamore. It includes more than 250 recipes using sustainable seafood. It’s chock-full of information on the most eco-friendly seafood, as well as others we should avoid because they are over-fished or harvested in ways that damage the environment. If there’s room for only one seafood book on your shelf, this would be the one. When buying scallops, look for dry-packed ones. Avoid the ones that have been dipped in a solution of sodium tripolyphosphate, which helps extend their shelf life. Not only will you end up paying more in weight for these plumped-up scallops, but because they are so packed with water, they will steam — rather than properly sear — when cooked. This easy dish is a little like the traditional coquilles St. Jacques, except that it’s made with a compound butter composed of dried porcinis, truffle oil, and sherry vinegar. A single-layer of scallops gets laid out in a gratin dish, with the butter smeared both underneath and on top of them. Dry bread crumbs are sprinkled on just before baking. I used Japanese panko crumbs, but you can use whatever you have on hand. The directions call for baking the dish in the upper third of the oven. I’m not sure if my having a gas oven had anything to do with it, but I found my dish cooked more efficiently and evenly on the middle rack of the oven. The scallops bake up moist and tender in a deep pool of butter. Crispy bits of dried porcini cling to the scallops, adding more color. It’s a rich and earthy tasting dish. It’s also a deceptive dish in that it’s so simple to put together, yet has a definite air of elegance and sophistication about it. The next time I make it, I might cut back on the butter just a tad, because you do end up with quite a bit of it melted at the bottom of the pan. Far more than enough to dip wedges of crispy, artisan bread in. No, it wasn’t the most economical dish I could have made. But had I ordered it at a restaurant, I would have ended up with maybe four scallops on my plate, not the sizeable dish of 32 scallops I pulled out of my oven. I may not be made of money. But eating this dish sure made me feel like I was — even if but for a moment. 8 tablespoons (1 stick) unsalted butter, softened. 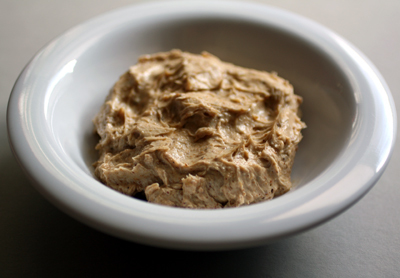 To make porcini butter: Combine butter, porcini powder, truffle oil, and vinegar in a food processor. Process until light and fluffy. Season with salt and white pepper, and pack into a small bowl. Leave butter at room temperature for about one hour for the flavors to develop, then cover with plastic wrap and chill until firm. To cook scallops: Place a rack in the upper third of the oven and heat oven to 450 degrees. Season scallops with salt and white pepper. Smear about 2 tablespoons of the butter in the bottom of a 1 1/2-quart gratin dish. Set scallops in the dish in a single layer (it may be a snug fit) and spread rest of butter over the top of the scallops. Sprinkle on bread crumbs. Bake until bubbling and lightly browned, about 10 minutes. Let scallops sit for a few minutes before serving. These scallops look absolutely fabulous! 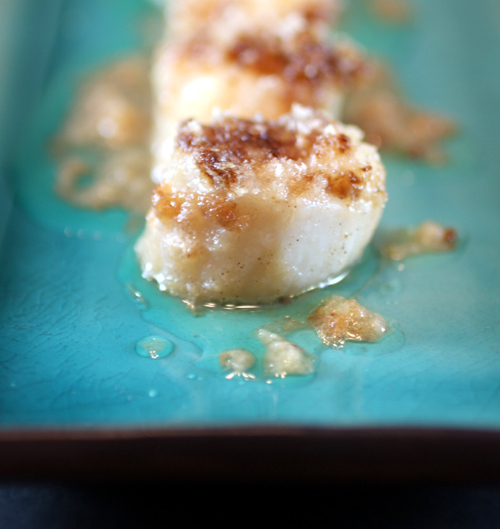 I love the idea of porcini butter – wow, I must try this right away – scallops are our ultimate favorite!!!! These look amazing! Thanks for the tip on selecting scallops. Yum! So, where did you get *your* dry-packed scallops? Porcini butter = genius. Now I know what to do with the small, dried pieces of porcini leftover from a bag of mushrooms I bought last fall! Nate, I often buy the frozen wild Japanese scallops at Trader Joe’s. OMG, this dish looks and sounds fantastic! I love that porcini flavor! 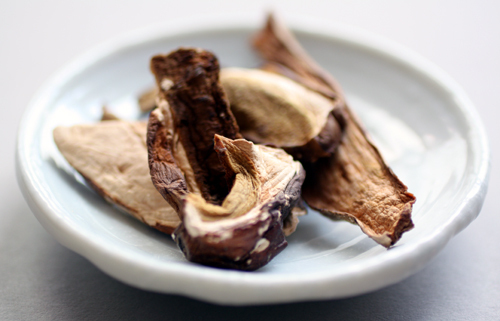 I have all the ingredients to make this but the spice grinder to grind the mushrooms 🙁 Any alternatives to make the porcini powder? Mrs. L: Do you have a coffee bean grinder? That’s actually what I use. I reserve one solely for spices, and another just for coffee. Barring that, do you have one of those teeny food processors? You could use that. Mortar and pestle? Probably a sharp chef’s knife would even get it down to at least a pretty fine dice. That looks so incredibly delicious! Treating yourself to good meal at home is great–and much less expensive than going out. My hubby used to race mountain bikes, but now does both road and trail biking. I believe that trying to pass someone on a trail is tantamount to a declaration of war – if I understand my husband correctly – a glove across the face as it were. (Men!) He has a good friend down in Santa Cruz and I think they’re training for a century or some other race in SC when they get back from their surf trip. I should see what race it is, and let you know – if your hubby is racing too maybe we could come up with a culinary activity to amuse ourselves. This dish sounds so good! You’ve coupled so many of my favorites: scallpos, truffles, and porcnini mushroom.s When I was in London, one of my favorite sourvenirs was a jar of porcini power I picked up at Fortnum and Mason. Sign, it was so good. It was like butter, everything tasted better with it. this sounds just amazing. yum! We could slather this all over little crispy toasts with cheese…the butter that is. It sounds as if an investment in good truffle oil is well worth the cost! Looks delightful and I’m sure it was a lot less than a restaurant meal. I made 2 filet mignons the other night and felt a little bad spending $22 on them, but at the same time it was a LOT less than I would have paid at CraftSteak or Peter Lugers. Fantastic looking. I’m inspired by this site. How decadent! I love this! How does one identify the scallops dipped in sodium tripolyphosphate, particularly if they’re in the display in bulk at your local fish monger’s, grocery store or (ahem) discount bulk membership big box market? Good question, GeoffL. If it’s a good fish monger, he/she should be able to tell you if the scallops were dipped or not. Also, packaged scallops that have NOT been dipped usually are labled “dry-packed.” If you see scallops that are sitting in a pool of water in a display case, chances are they have been dipped. Look for scallops that are firm, and with a color of translucent white to almost light orange, according to Chef Rick Moonen. Those that are dipped tend to be more opaque white. Hope that helps. Where can I find porchini butter and have you ever come across ghost chile oil?